Making a comparison between BlueHost & GoDaddy can be tricky and nailing down what to compare against can be even harder! We’ve decided to split our battle between the hosts into several categories, comparing their pros and cons alike. After all, you want to choose the best web host for your needs, so one may tip the scales depending on what type of website you want to host; we’ll check them out for you so you can get the best insight into which provider to choose. 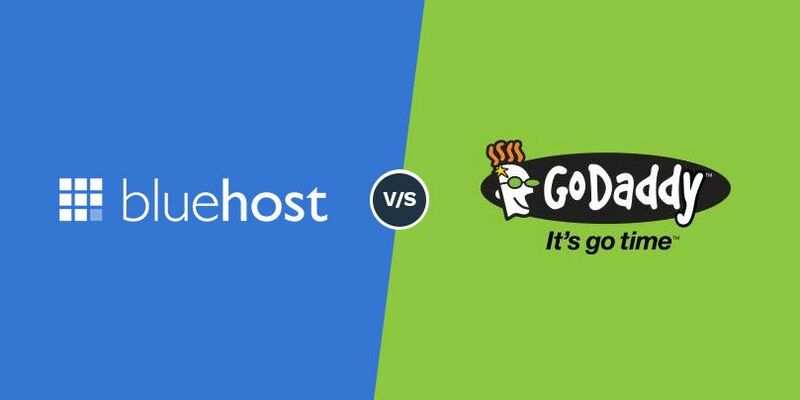 Here’s my comparison of GoDaddy vs BlueHost. Performance is a brilliant measure of how good a web hosting company really is; after all, you want your website to perform well in terms of speed, reliability, and availability. If a web host can’t handle the infrastructure required, or can’t manage it efficiently to run a host of websites, they should be taken off your choice list straight away. Firstly, we took a look at each web hosting company’s loading time, pitting one against the other to determine who wins the race. 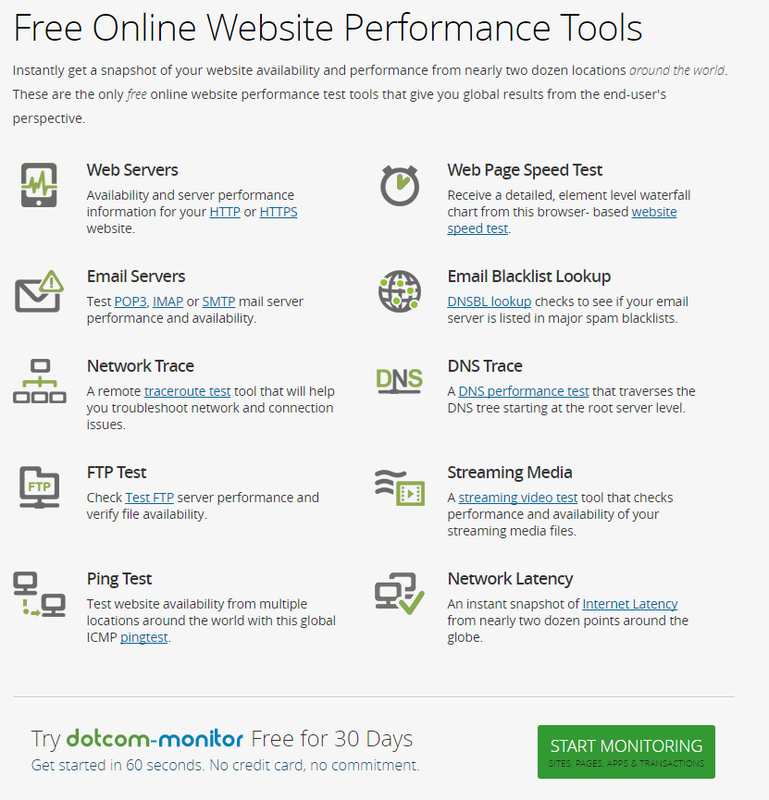 Running a speed test is the most efficient way to gain these results using a selection of websites using Dotcom Monitor which allows you to run a single test across multiple locations to gain the most versatile results. Running the tests presented some interesting results; BlueHost’s fastest load time was around 1.4 seconds with an average loading time of 3.2 seconds. This was a little disappointing to see as most website users will abandon a website if it’s not loaded within 3 seconds, so the results of BlueHost’s average loading time could potentially compromise your customer base. Unfortunately, GoDaddy performed rather shockingly, with the best load time of 3.5 seconds; the worst being nearly 17 seconds! This kind of performance will not attract customers or viewers to your website, and would certainly sway us away from using GoDaddy if our website is to be reliant on performance speed. Customer support can often be a key player in whether someone will choose one company over another. If something goes wrong, even if the web host company doesn’t necessarily offer the best prices, they’ll likely choose one with expert customer support. Saying that, it’s also often the case that different people’s experience of the same company can vary, so we took a look at the support options BlueHost and GoDaddy offer, and our personal experience with them. BlueHost offer a variety of support options, which is great because it doesn’t limit their customers to contacting them in only one way. BlueHost offer phone support, chat, email, and ticket support which runs 24/7/365 – this means that they are available all of the time, whenever you may need them. BlueHost’s support is very good; they provide you with answers to questions without fumbling around, and offer expert advice across the board. Their wait times aren’t the greatest, but once you do get through to someone, their support is at the top of their game. GoDaddy also offer a variety of ways to get in touch, including via telephone, live chat, email, and through their ticket system. They provide global support, so you won’t ever have to worry about paying for a premium rate number to get in touch. Their telephone support is really great, probably one of the best we’ve experienced, however, when it comes web hosting support as a whole, their knowledge seems to be lacking somewhat. We tested them on a few areas, and web hosting always fell to the bottom in terms of knowledge and the time it took to get an answer, which was really disappointing. When it comes to ease of use and user experience, a web host should really be offering the best control panel available to their customers; many first time users will not have much experience and therefore need a simple UI that’s easy to navigate and simple to understand. That being said, it doesn’t mean the control panel should be minimalist and lacking in features. BlueHost has a really nice user interface that makes it extremely user-friendly, even for beginners. The UI on their cPanel is intuitive and you can really see that they’ve thought about their customers when they built it. 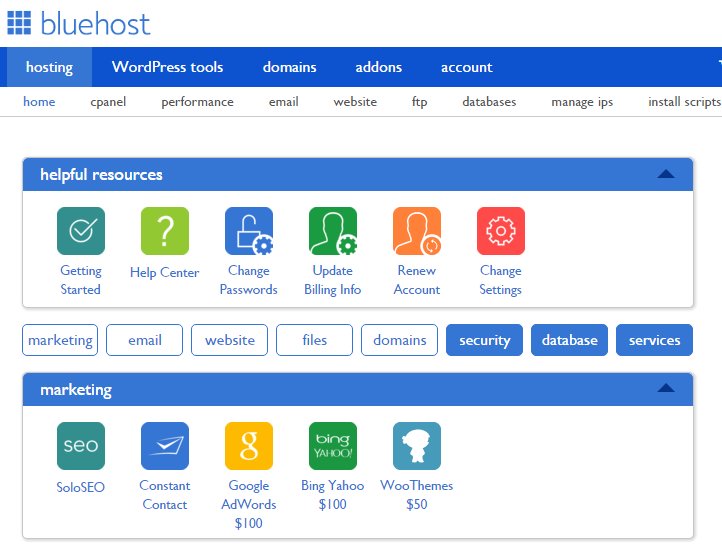 BlueHost’s cPanel is easily integrated with WordPress, which is obviously a very popular platform for creating websites; personal or business. With an easy install of WordPress, BlueHost customers can get cracking on their website straight away, backed up by a web host with excellent performance and expert customer support. 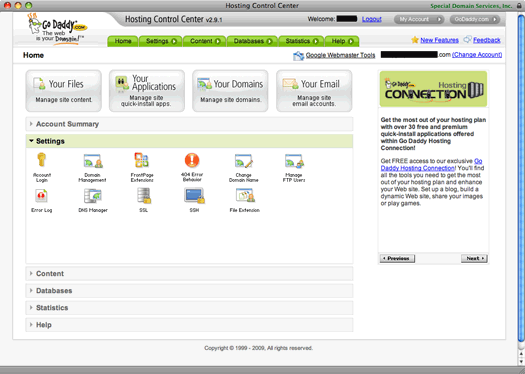 GoDaddy also use cPanel, which makes for another user friendly experience. However, their domain interface is something which really stands out for us – it’s clean, easy to navigate, and really easy to pick up straight away. Perhaps it’s because their overall niché isn’t based on web hosting, but something was lacking for us when it came to the hosting side of things with GoDaddy’s interface; the cPanel felt quite disbanded and it didn’t feel like it integrated with their website overall. When looking for the best web host, you’ll want to compare the features they offer versus the plans and pricing that come with the features. Initial prices are always going to be cheaper than renewal prices, so you’ll need to take this into consideration too. For $2.95 per month, BlueHost offer 1 website, 50GB storage, 1 domain, 5 email accounts, and 100MB of storage per email account. If you jump up to their next pricing plan, almost everything is unlimited and unmetered at only $5.95 per month, with $200 worth of marketing offers available too. GoDaddy’s pricing plans start from £2.99 per month with 1 website, 100GB storage, unmetered bandwidth, a free domain and 1 mailbox account with the option to add more. Their next plan is £4.49 and comes with mostly unlimited options, similar to BlueHost. Both web hosts provide very similar features within their plans compared to each other, at roughly the same cost; this is quite common within the shared web hosting space, but when we think back to ease of use and the features that come with each web hosting plan, BlueHost always seems to tip the scales. Bluehost really do live up to their reputation; their web hosting plans offer a wide range of features for a very reasonable price, including 1-click installs for WordPress, making it a perfect choice for beginners and experts alike. BlueHost offer great features, and a really intuitive cPanel that is easy to use, and shows how much effort BlueHost put in for their customers. Although GoDaddy does offer similar features for the same price, BlueHost wins in every category; the speed of their websites, the ease of use, and customer support is hands down better than GoDaddy all round.